Just 15 feet below Los Angeles streets like Wilshire and La Cienega is a literal treasure trove of ancient bones. A team of paleontologists working with the Metro Purple Line Extension project have uncovered hundreds of fossils near Beverly Hills. It's not the first time the project has turned up ancient creatures. We got a sneak peek at some of the new fossils currently being held at the La Brea Tar Pits Museum. Paleontologist with @Cogstone found hundreds of Ice Age fossils while working with @metrolosangeles as they dug up the ground for the Purple Line expansion project. 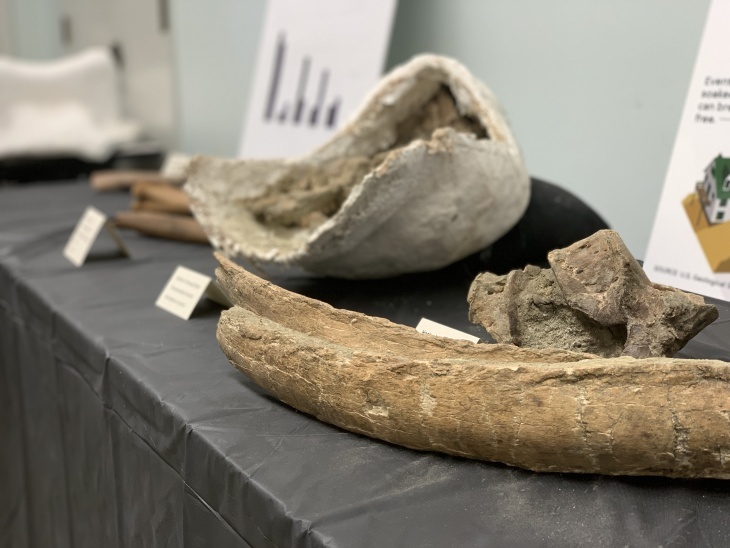 During a media event Monday, black tables set up in the museum basement overflowed with the bones of long-dead mammals like ancient bison, mammoths, camels and horses. 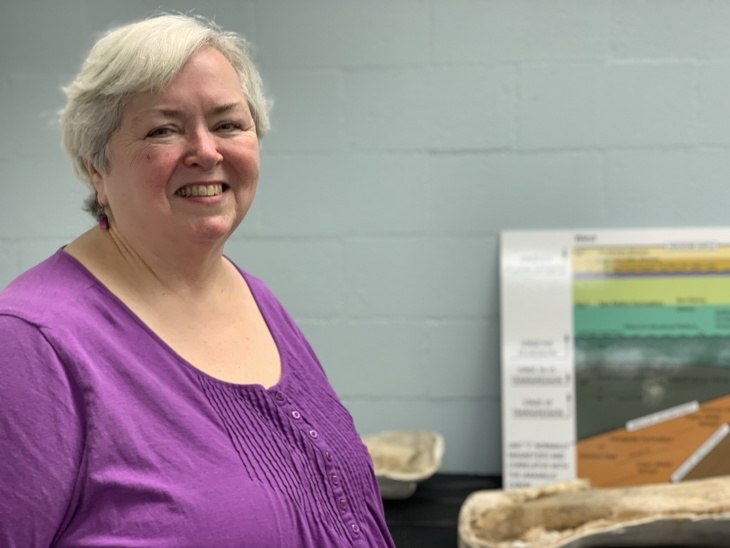 Principal Paleontologist Sherri Gust said her team uncovered more than 500 fossils at three different station sites — La Brea Avenue, Fairfax Avenue and La Cienega Boulevard — and more keep popping up. "Nobody was expecting fossils from La Cienega, and that's where most of the fossils are coming from," Gust said. "So Beverly Hills, who knew?" Gust works for Cogstone Resource Management, a group contracted by Metro to bring paleontologists to work alongside construction teams. Gust says this way paleontologists can identify fossils and properly protect and excavate them from the work site as crews build out the rail line that will connect downtown Los Angeles with Westwood. Metro spokesperson David Sotero said the excavation work falls within the Purple Line's $9.3 billion project budget. 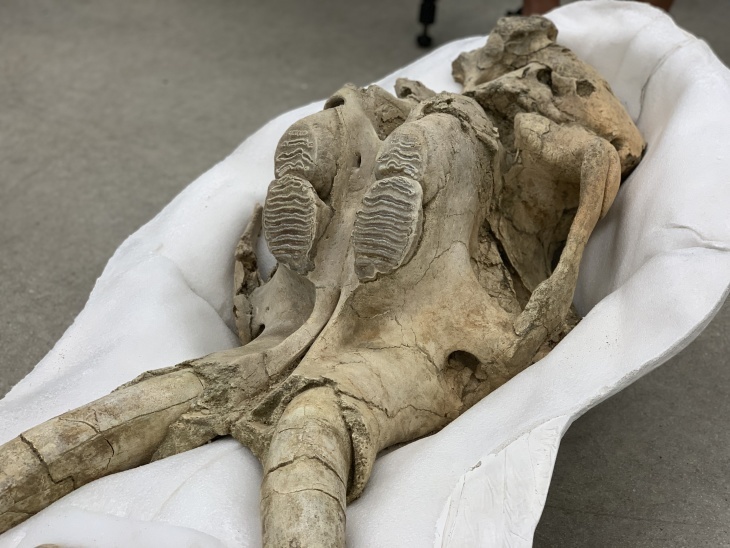 Some of the most interesting finds, according to Gust, are rare fossils from sabre-toothed cats and a fully intact skull that Gust estimates came from a 6- to 8-year-old mammoth. Paleontologists even unearthed two sea otter bones from deep below the surface. "The land sediments here are only about 45 feet deep. Below that, it's all marine," Gust said. Not all of the fossils are dated yet, but some findings indicate the animals lived between 11,000 and 50,000 years ago. Some of the fossils were found in sediments that indicate an ancient mudflow may have occurred, one likely caused by a wildfire. Unlike the death trap that caused La Brea's famous tar pits (researchers believe predators and prey congregated in the tar before they got stuck and died), the latest findings show a glimpse of what researchers suspect was a more typical slice of ancient life. "It's nice to be able to get this picture of what sort of the real natural community looked like, because you can't get that here at La Brea," Gust said. Metro also uncovered fossils in 2017 during work on the Crenshaw/LAX line. In the future, you'll be able to see the newest fossils for yourself at the Natural History Museum — but Metro hasn't indicated yet when that might be.